Himachal Pradesh has proposed a budget outlay of Rs 2,384 Crore for the Public Works Department during 2014-15. Presenting his 17th budget, spread over his record five chief ministerial stints in the state, Himachal Pradesh Chief Minister Virbhadra Singh has revealed that for 2014-15, state government has fixed a target for construction of 450 km. of motorable road, 40 km of Jeepable road and 30 bridges. A target of 2,000 Km. for periodical renewal of existing roads has also been fixed and 550 km for metalling/ tarring of new roads would also be carried out. In addition, 406 building works have been targeted for completion during 2014-15. Apart from this, cross drainage of 600 km would be carried out. My Government has taken a decision to allow price escalation of Bitumen in PMGSY works and addressed issues regarding availability of construction material under the new Mining Policy. Virbhadra Singh said that the State currently has a network of 33,325 km. of motor able roads which covering 3,027 Panchayats of state. He stated that remaining 216 Panchayats will be connected with the road facility soon and works of road in 179 Panchayats are in various stages of progress. Chief Minister stated that under the Pardhan Mantri Gram Sadak Yojna, 3,016 eligible habitations have been connected and 10,064 km. road length completed. Works are in progress to connect the balance 596 sanctioned habitations. Himachal is being funded under PMGSY by the World Bank Assisted Rural Road Project (RRP-II), under which project approvals worth ` 516 Crore have been received. 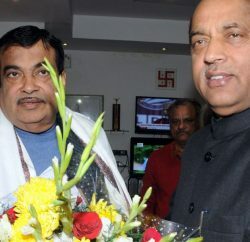 Emphasis would be given towards metalling and tarring of the existing road length under PMGSY and providing new connectivity, for which I have fixed a target of availing sanction of ` 300 Crore for the year 2014-15, from Government of India, Virbhadra further added. He also detailed out the proposed plan of constructing tunnels to shorten the travel distances. He apprised the speaker that Govt has approved to invite International Competitive Bid on Build Operate & Transfer basis from private parties for the construction of ‘Bangana-Dhaneta-Tunnel’ and DPRs for ‘Bhubujot-Kullu’, and ‘Holi-Utrala’ tunnels are being prepared from Consultants. Besides this, the work on Pre-Feasibility Study Reports of two Tunnels namely ‘Tissa-Killar Tunnel under Chaini Pass’ and ‘Chamunda-Holi Tunnel’ has been assigned to SJVN Limited Shimla, Singh revealed. Virbhadra Singh said that the allocation for the World Bank funded State Road Project has now been revised to Rs 1,800 Crore. Out of the ten up-gradation projects, three have been completed and another three are scheduled for completion by June, 2014, he added. 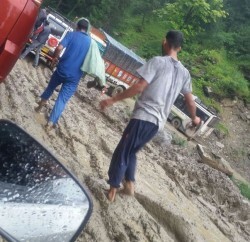 CM said that the ‘Theog-Hatkoti-Rohru road’ and the ‘Sarkaghat-Ghumarwin road’ have been re-allotted. Emphasis is also being made on introducing performance based contracts on a Pilot basis in each of the Zones. With support from the World Bank a consultancy for road accident data management system has also been taken up. Singh said that the state government according high priority to National Highways. At present, there are 12 National Highways having a length of 1,553 Kms. in the State. Proposals involving nine roads having a length of 1,157 km have been taken up with Government of India for declaring them as National Highway. 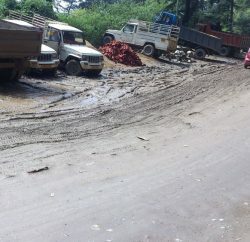 The Government of India has made a policy to connect every district Head Quarter with nearest National Highway which will benefit the districts of Chamba, Kangra, Una and Kinnaur. During the year 2013-14, annual plan of ` 233 Crore for original works and ` 160 Crore for periodical renewal was approved by Government of India. The NHAI is executing two major Projects of four-laning in Himachal. Work on ‘Kiratpur-Nerchowk road’ has been awarded for Rs 1,818 Crore and work has commenced from November, 2013. The Parwanoo-Shimla four laning project is estimated to cost ` 2,500 Crore, for which approvals relating to forest and land acquisition are in the final stages, Chief Minister stated in his budget address.